Just purchased my 2nd e36 M3. This will be a full track build. Car will be here this week, but title and funds have already changed hands. 1998 M3 coupe. Cosmos on Dove. 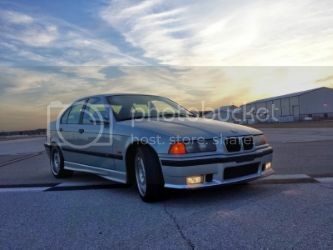 202k, interior is not good, outside is very clean and needs some tlc for seals/bushings. My first BMW. I was really looking for an M3/4/5 but opened my searching to 1997 and 1998 M3 to get more hits. Must have was 5 speed. No red, no violet. I found a 1998 M3 Vert 5 speed. Titanium with Dove Gray interior. Radio volume had a mind of its own but seller included a NIB Kenwood with harness and antenna adapter that I installed. Even with the repairs needed, I haven't regretted it a second. Looking forward to having it here. My 5th bmw, loved them all - but for me at my age the AT, plus all the M equipment makes for a nice ride. You would have only found an m3/4/5 in 97'-98', iirc, those were the only years they were produced in the e36 chassis. What year were you looking under? Edit: this applies to U.S.
Last edited by Psyper; Thu, Aug-28-2014 at 03:15:26 PM. Awesome idea. Still seems accurate. Not to bump an old thread but ya I am going to. Lol I just recently picked up a 97 Boston Green on Modena Slicktop M3 4/5 with 172,000 on the clock for $4700 according to the formula it values out at close to $5400. Now it does need some work but it's not a POS. In fact it was well maintained during a good part of its life. Needs a little paint work up front( clear coat) with a couple of standard door dings though paint is glossy and good on sides, roof and rear. All numbers match on all body panels . Engine runs strong and trans is in very good cond. Needs a left front lower control arm ball joint and shocks. I am about to refresh the whole,suspension. Have driven it to the Bay Area and back to Los Angeles for Christmas and it drove like a dream. Most of the work I am going to do is upgrade enhancements like rtabs upper strut mount reinforcements etc.. Interesting thing about the value calculations is I am seeing prices all over the boards right now. Like my car cleaned up for example. I have seen similar mileage different color going for up to 8-9k and I have also seen the flip side which is cars like mine selling in the $4500-5500 price range. Last edited by Dpro; Sun, Jan-04-2015 at 07:41:12 PM. I just picked up an early 1998 M3 coupe manual in cosmos black with 63.7k miles for $14k. Had to change the evap solenoid, brake circuit switch, belts and tensioner. Just bought my first m3 (finally). 1997 Coupe Cosmos on black lux pack but the seats were swapped for vaders. 5 speed, new zhp shift knob. Not perfect but well maintained and taken care of. P.O. refreshed a lot of stuff with OEM dealer parts, so thats a plus. 126k miles. I paid $6500 from an original asking price of $8500 that dropped to $8000. For the car how it sits, i think i got a pretty good deal. Formula is reading $5876.29 so, if that is still accurate, i didn't pay too much more considering it is in great shape. Clean carfax that stated supposedly worth 960 above book value. I'm happy with it so far, and i'll be around the forum way more often now. Formula isn't accurate anymore but sounds like a great car for the price! yeah i didn't think it would be. and yeah, it has its quirks but they will be sorted out. All times are GMT. The time now is 06:54:49 PM.